The Sunday Observer /Mobitel Most Popular Schoolboy Cricketer Of The Year, contest is on it’s final phase as the penultimate coupon will appear today and the final coupon on June 8th as arrangements for the selection of the main award, The Sunday Observer /Mobitel Schoolboy Cricketer of the Year will take place in due course. The last coupon will appear on June 8th Sunday Observer as the Most Popular schoolboy cricketers of all three segments Platinum, Gold and Silver will be selected purely on votes received. In the main contest Schoolboy Cricketer Of The Year, will be chosen by a panel of senior cricket umpires from the Association Of Cricket Umpires (Sri Lanka) purely on merit taking into consideration how they fared during the season. This system has done wonders for Sri Lanka cricket as the top performers in all three categories are recognised for awards. With the competition split into three segments platinum, gold and silver more and more players from the rural schools have got more opportunities than in the past. There is ample testimony with schools like Madampa MV, Ambalangoda, U.B. Wanninayake MV, Galgamuwa and Madeena Central from the hill capital entering the contest may be for the first time. Judging by the number of votes received for their players namely, Mohammed Ziras (Madeena MV), Hareen Samarasinghe (Madampa MV) and Sanjaya Wanninayake (U.B. Wanninayake MV) it augurs well for the future competition and future cricket. 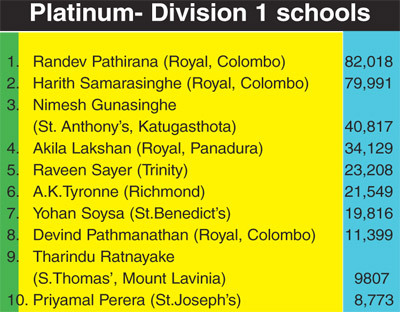 There has been a hectic tussle between the two Royalists Harith Samarasinghe and Randev Pathirana who are vying for the top positions in the Most Popular Schoolboy Cricketer Of The year category in the ‘Platinum’ contest for division one schools. The pendulum has swung either way in favour of Samarasinghe and Pathirana during the eighteen weeks counts with both receiving over 70,000 votes from their supporters. Both players have fared well during the concluded school cricket season as useful all-rounders. 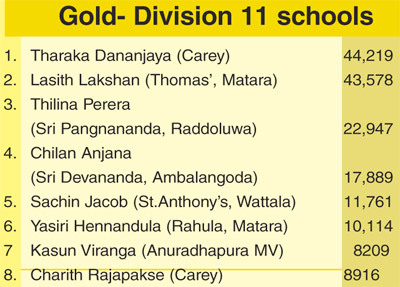 In the division two ‘Gold’ segment the fight for the top position was mainly between Carey’s Tharaka Dananjaya and St. Thomas’ Matara’s Lasith Lakshan. These two players have also topped the 40,000 vote mark and presently the deficit between the the two are 641 votes. 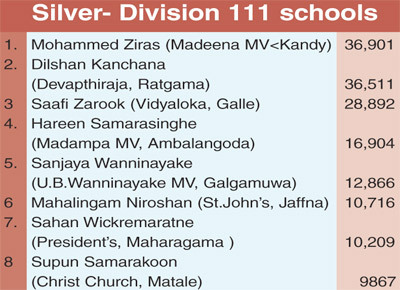 In the ‘Silver’ the top three, Dilshan Kanchana (Devapathiraja, RaRatgama), Mohammed Ziras (Madeena MV) and Zaafi Zarook (Vidyaloka, Galle) have been in the forefront right from the beginning and have been getting lot of support from their followers.